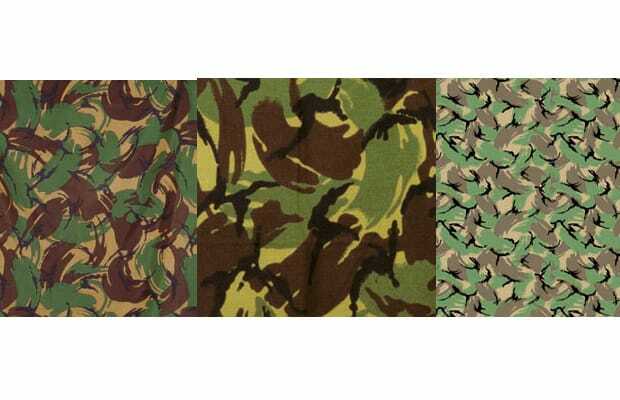 Developed by the Army Personnel Research Establishment in Farnborough with the help of civil servants of an artistic background, ‘DPM’ (Disruptive Pattern Material) is the distinctive camouflage of the British Army. The first trial uniform made of ‘DPM’ fabric was issued in 1969, mainly to troops in Northern Ireland, but the cut was based on an olive drab uniform produced in 1960; hence it was called ‘pattern 1960 DPM’. The next uniform to be made with ‘DPM’ was called ‘pattern 1968 DPM’ but was not widely issued to troops until 1970. Later in the 1970s a tropical uniform was issued consisting of a shirt, trousers, and a bush hat. This uniform featured ‘DPM’ in a richer color scheme suitable for jungle environments and has since featured several subtle changes of color – in one version the brown has a red tinge, for example. Color differences also often occurred because the various manufacturers contracted to produce ‘DPM’ rarely used exactly the same dyes. Later uniforms – ‘pattern 1984 DPM’, ‘pattern 1994 DPM’, ‘Soldier 95’, and ‘Soldier 2000’ – featured improvements in the cut and durability of the cloth, and colors sometimes varied (for example, the tan color on some of the ‘1994’ uniforms had a mustard tinge), but the distinctive ‘DPM’ pattern remained the same.